The aim of this interdiciplinary project is to explore the notion of 'deep time', particularly human-environment interactions in context of Las Ramblas - the iconic ephemeral rivers of southeast Spain. We will use traditional techniques within a novel graphic and text-based framework to produce a rich visual dialogue that documents the physical, biological and cultural evolution of river forms and landscapes. Judy and Mark Macklin's recent collaborations include land-art interventions related to the Neolithic and Europe's first farmers in Romania, and a 'sense of place' in the peatland rivers of Ireland and the Netherlands. This project will explore the seemingly counterintuitive notion of 'dryland rivers' and the role of water and water (mis)management in creating a palmipsest of landforms. Issues considered will be: Ice Age legacies, prehistoric and historical land-use, rapid climate change and the impacts of anthropogenic global warming. Judy’s theme of 'Sacred River Landscapes' is prompted by her growing interest in exploring the developing narrative of river civilizations and environmental change, which in this exhibition focuses on describing visually how energy is transported and transformed by channelled water. It builds on her previous work with archaeologists and geographers in Romania and Wales that seeks to understand how river histories shape land and lives, and gradually reveal rhythms in process and pattern central to time, place and soul. Rivers can transform the local and wider landscape on a temporary or permanent basis. They do this by erosion and movement of soil and sediment around river catchments during floods, and through depositions in new forms such as bars and islands. These landforms are not only aesthetically pleasing but can also be analysed and interpreted to reveal how and when they were created, thereby providing an environmental history. Rivers produce a palimpsest of 'marks' in the landscape commonly in the form of abandoned channels (palaeochannels) that display a wide variety of geometrical shapes and patterns. These can be 'read' using aerial photographs, satellite images, Google Earth, old maps as well as on the land surface using GPS and field walking. Their 4D (space-time) relationships can also be deciphered by analysing and dating sediment, wood, bones and artefacts that infill these abandoned river courses. These materials record and preserve changes in the landscape resulting from both human activity and climate-related changes in flooding regime. One very important and potentially controvertial issue that the Măgura intervention addresses is how its inhabitants who live adjacent to and use the Clanita and Teleorman river valleys for farming and water, perceived change in the river landscape and the factors that control it. A 4-day workshop was run from 17th to 20th July in Măgura School involving 40 children and their teachers. 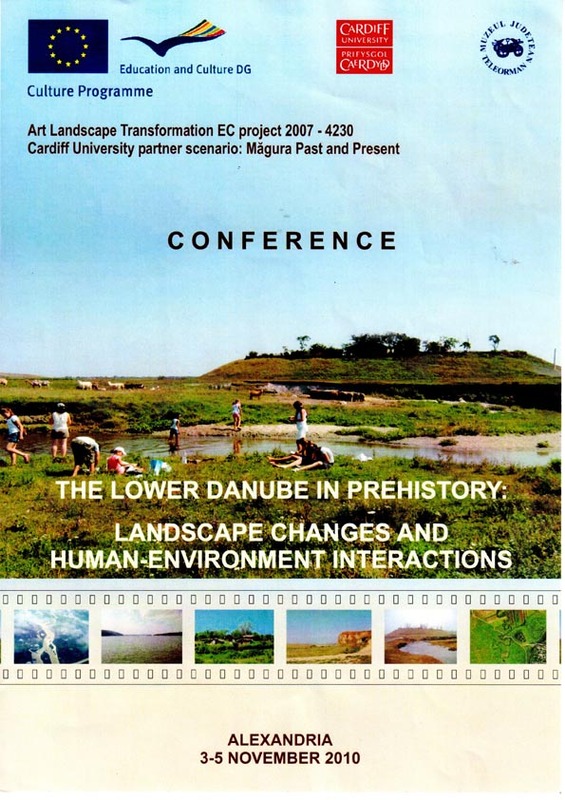 The participatory activities that were used to explore these issues and to create a shared cross-generation experience fall within the disciplines of Art (Land Art and Fine Art), Archaeology, Geomorphology, and History and required some translation of the spoken and written word in both Romanian and English. The project had three primary objectives. First, to inspire in the children a sense of self, set in a particular place and time. Second, to research and to develop with them a greater awareness of the local riverscape and rural environment highlighting links with pre history and human response to environmental damage. Third, the design and production of a series of small mosaic tiles (20cm x20cm) based on this theme using modern and ancient found objects. The mosaics evidence not only the time spent with the children but also a shared river experience with the workshop leaders (JM and MGM) and the school. Aberystwyth Printmakers (A/P) was established in 2004 by a group of artists all of whom use print techniques in their practice - including etching, lithography, screenprinting, wood engraving, woodcut and linocut. The group’s aim is to promote printmaking as an artform; which is fulfilled by giving lectures, demonstrations and exhibitions of members’ work and - most importantly - through the provision of shared printmaking facilities. The group has grown in recent years and now has 64 members. For this exhibition Judy Macklin (former AP Director) issued a challenge to her fellow members: make prints within the size of an A4 piece of paper. Many of the works are new, having been made at recent joint printmaking sessions, run by Judy and other members of AP, and in addition a space within the exhibition has been reserved for works made by members of the public who also attended these open workshop days. This project involved Aberystwyth Printmakers (AP) and Ceredigion Museum, Aberystwyth. 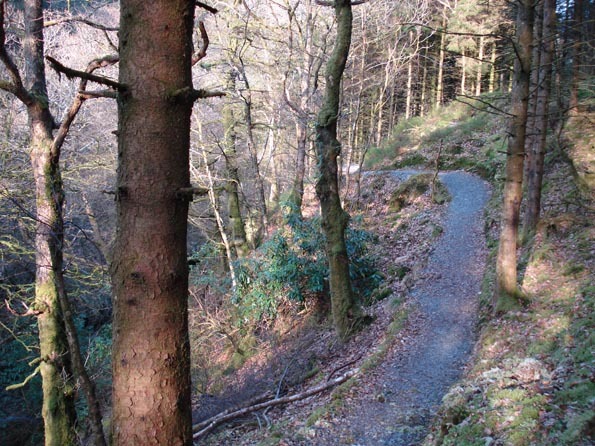 It was initiated by the museum inviting members of AP to visit the historic Hafod Estate which lies above Devil's Bridge in the Ystwyth Valley, whose great mansion and many acres were created during the 18th Century and represent a prime example of the picturesque movement of the time. The prints made by AP members resulted from several visits to Hafod and represent their individual response to the estate. These prints were exhibited at Ceredigion Museum side by side with the colour lithographs of John Warwick Smith printed in 1809. In 2006, having received a grant from the Crawshay Travelling Scholarship, Judy Macklin spent three months at The School of Art, University of Arizona researching techniques in lithography. The primary aim of her study visit was to develop links with fellow printmakers in the USA and to disseminate the experience to students through teaching and learning. Three portfolio exchanges between students at The School of Art, University of Arizona during 2006/07 have been a direct result of this collaboration. This initiative was followed up when Judy Macklin attended a three week summer workshop at the Tamarind Institute, Albuquerque in July 2007 supported by the Arts Council of Wales. The Earth & Sky: Tucson & Aberystwyth exhibition builds on firm foundations laid in preparation for this ongoing commitment to enhancing printmaking processes, printmaking personalities and opportunities to share them. A community project to make 2 entrances onto the boardwalk across the historic raised bog. The first entrance involving a living willow arch and the second entrance a carved arch made from Welsh oak. A community project to build a site specific mosaic.Wall mosaic made from glass tesserae representing the flora and fauna of the dunes and beach. Floor mosaic made from beach pebbles incorporating individual glass tesserae ‘roundels’ telling the story of the flooded kingdom of Cardigan Bay, the legend of Cantre'r Gwaelod. A contract with the Forestry Commission Wales to provide interpretive artwork for the new Visitor Centre and forest trails.Creu-ad has designed and made a range of interpretive art work within the Visitor Centre that includes children's tables and seating, a large wooden wall panel, bi-lingual text to reflect poetic responses to woodland and banners that express something of the sensual and emotional reactions that trees and woodland inspire. A series of 12 framed works representing the Forestry Commission's choice of 4 tree species. Each species was honoured by presenting a slice through its trunk to show its end grain, a wood block sawn on its long grain, and a printed image to describe its form using the reductive woodcut process. Each set was framed in the wood to match. Judy Macklin was awarded an Arts Council of Wales Training Grant to attend the Tamarind Institute, Albuquerque, New Mexico which is internationally renowned as a centre of excellence for Aluminium Plate Lithography.The summer workshop was led by Master Printer Bill Lagattuta in 2007. The Geoffrey Crawshay Scholarship fund was established to enable successful candidates to travel Britain or abroad with the intention of enriching the student's aesthetic experience in a branch of the Fine Arts. Judy Macklin was the 2006 winner of this award and sought to widen her horizons and experience of landscape, environments and culture by touring extensively across the world and visiting Belize, Guatemala, Honduras, Mexico, and the USA. The primary aim of her study visit was to develop links with fellow artists and printmakers. During her many months of travel she halted at Tucson in the desert, where The University of Arizona, played host for an extended working period which enabled Judy to create a new series of lithographs and woodcuts.Three portfolio exchanges between students and staff at the School of Art, University of Arizona and the exchange exhibition Earth and Sky: Tucson and Aberystwyth have been a direct result of this collaboration. Judy has been working and visiting Greece since her second- year undergraduate 'Travel Abroad' project in 1978 gave her the opportunity to research many of the major archaeological sites in mainland and island Greece. A Northern Arts Travel Bursary in 1991 facilitated a prolonged stay on the Island of Evia, as a guest on the Noel-Baker estate where Edward Noel-Baker in 1832 (cousin and protégé of Lord Byron’s wife, Annabella Milbanke) first established the family residence.